Hanuman Jayanti 2018 will be celebrated on Saturday, March 30. The Hindu religious festival is observed to mark the birth of Lord Sri Hanuman, who is known as one of the biggest devotees of Lord Rama. Lord Hanuman is immensely devoted throughout India and Nepal. Hanuman Jayanti is observed on the full moon day which is the 15th day of the Shukla Paksha in the Hindu calendar month of Chaitra. It was Hanuman’s devotion to Lord Ram that helped him defeat Ravana after Sita’s abduction. Devotees flock Hanuman temple to offer special prayer to the God. Hanuman is believed to have magical powers with which he conquers evil spirits. On Hanuman Jayanti, devotees apply tilak of sindoor on their foreheads from Hanuman’s idol. There is a mass distribution of food outside the temple who come seeking blessings of Hanuman. People worship him and hail his magical strengths to keep away evil powers and troubles. Lord Hanuman is known for his intent, grit, and physical energy and also has the ability to transform into any form. Hanuman is the son of wind-God Pawana and is believed to possess herculean abilities. Religious texts have it that he has the power to lift an entire mountain with just one hand. On the special occasion, devotees flock outside temples to worship him and seek his protection and blessings. People chant special prayers like Hanuman Chalisa and Sundar Kaand etc. 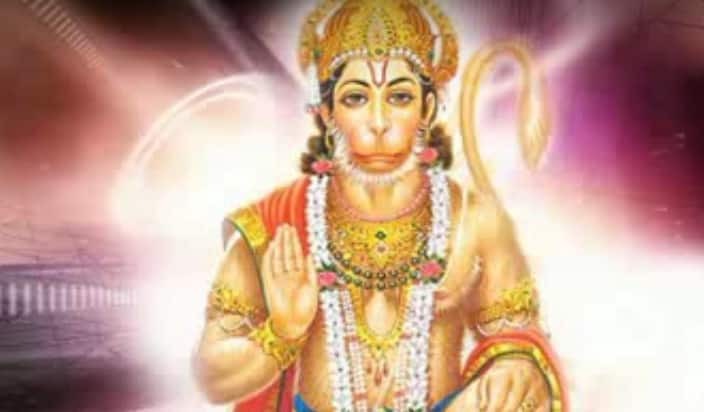 Here are the steps to perform Puja on Hanuman Jayanti. On Saturday, March 31, go to a Hanuman Mandir or temple and read the Hanuman Chalisa and shlokas related to Lord Hanuman. Offer flowers and garland Lord Hanuman’s idol with roses. This is one of the easiest ways of appeasing the Lord. Light a diya of ghee and pour mustard oil on the idol of Lord Hanuman and sing bhajans glorifying Lord Hanuman.